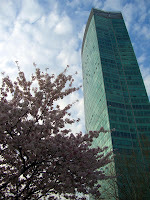 I first walked in 여의도 (Yeouido, South Korea), a part of 서울 (Seoul), on 12 April 2009 to enjoy its famous cherry blossoms. Although the peak had passed, the streets were beautiful, and the blue sky greatly highlighted the flowers. Moving to 여의도 공원 (Yeouido park), I got greeted several times in English by Korean children, who then asked whether I was American, which is unsurprising as most white guys in the country must be American soldiers; the kids looked pretty confused to learn I was French! However, the young adult who accosted me to offer an Easter egg and invite me to join a Christian group was not unsettled by my nationality. Later, I started wondering what spontaneous contacts to expect from women and elders in the capital as well as from all kinds of Koreans in the countryside... Beyond the social sphere, the park itself was enjoyable, with a beautiful statue of 세종대왕 (Sejong the Great) and specific ambiances associated to each area. Since my move to South Korea, it was my first time to actively visit the capital and reflect upon life here while observing children, families, couples, small and huge groups of friends, and a few elders. People visibly enjoyed their afternoon with diverse activities, infusing the park with peacefulness and liveliness. The nearby cherry trees reminded me of Japanese spots but the open spaces of 北京 (Beijing, China) (see Post 28 July 2007); the greetings from smiling kids, however, had a unique touch.